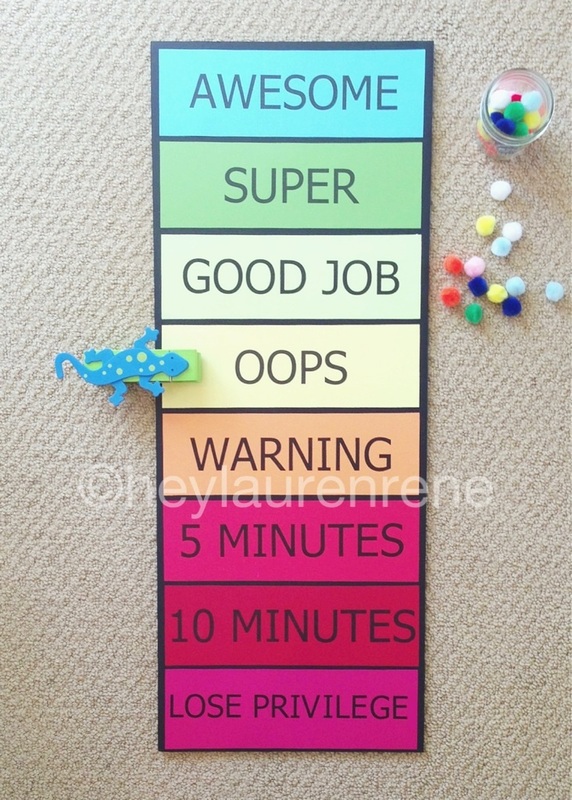 While looking through Pinterest last night I came across this behavior chart. It really stood out to me as something that I thought could work well with Nathan. Lately I have been trying to come up with a solution for his constant request for things….Mommy, after school can we go to the mall and get a Lego Police Station? Mommy, after we go to your store we can go to my store and I’ll get ice cream ok? Mommy, can we go to Toys R Us today and get a giant Nerf blaster? So and So has a Nerf gun, I want one too. I understand this is pretty typical behavior for a 3.5 year old, but it drives me nuts how obsessive he is about. It is literally what he talks about ALL.DAY.LONG. Since he doesn’t really understand the concept of time (Nathan, when it’s your birthday we can put this on your wishlist), I have really been struggling with explaining to him that he can’t have everything he wants. Or if it is something that I think he deserves, I want him to know we are proud of him and that eventually he can be rewarded for his good behavior. Then the desperation kicks in…and I lose sight of the difference between rewarding good behavior and bribing him. He starts acting up, he fights me to get in his car seat, he won’t listen to me at the grocery store and I feel myself getting flustered….and then I blurt it out “Nathan, if you listen to Mommy we will go get you a Lego Police Station!!! !”….Nooooooooooooo, why in the world did I just say that? Talk about being inconsistent and sending the wrong message to him. I completely panic and say the first thing that I know will get his attention. I don’t even realize I’m doing it, but then I will hear Greg do the same thing and THEN I realize just how wrong it sounds. That is why this chart stood out to me. In addition to the fun of the chart itself, you also earn “pom-pom points” along the way. Once he has enough pom-poms to fill his jar THEN we can go get a special reward. This doesn’t necessarily have to be a toy or a treat either if you aren’t into that, it could be a trip to the zoo, a movie date with Mommy, a baseball game with Daddy….whatever you think is great incentive that will keep your child interested. Also, the “5 Minutes” and “10 Minutes” can be changed to other words if time-outs aren’t your thing or don’t work for your child. We call them “taking breaks”. They aren’t forceful or meant to make him upset, he just gets to spend some quiet time in his room to catch his breath and calm down. I’m pretty optimistic that this chart is going to be very helpful in our household. It will keep me and Greg on the same page, it should hopefully keep Nathan interested, and I love the visual nature of SEEING the cause and effect of your actions. The pom-poms in the jar also give him a sense of time which really helps us avoid saying “someday”, “when you get bigger”, “maybe for your birthday” etc etc. He was AWESOME with it today. Asking if he could help me make dinner, if there was anything Shane needed, if I wanted to see him eat all his food….and the real kicker, he went right upstairs and asked to take a nap so “the lizard could climb up the chart”. I couldn’t believe what I was seeing! I will keep you posted on the progress we make with it. If you wanted detailed instructions on how to make one you can find them here. I made ours on foam core board instead of poster board like the above blogger used. I also didn’t make ours hanging, I liked having the firmer board so I can move it around to different rooms if I needed to. We will probably adjust the “rules” a little bit to cater to our household, but the ones in the link are great and you can just print those out and keep with your chart. I found the large clothespin at the $1 checkout line at Michael’s, and glued on the little wooden lizard that I also found at Michael’s. You could use anything on your clip. And if you have more than one child they can each get their own unique clip and use the same board. So far the lizard worked out great because Nathan loves thinking that it’s climbing up and down the wall for him. There seem to be a million and one ideas and opinions on how to raise a well-behaved child. What works for one may or may not work for another. I know my sister and I came from completely different molds, so I’m sure my parents just had to adjust what they did along the way and roll with the punches. I know consistency is key, but I also think trial and error comes into play quite often too. So….we are going to give this one a try. It’s in line with what we have been doing but it’s a much more organized version of it. I’m actually hoping it helps keep my behavior in check just as much as it does Nathan’s. I’ll make sure to update how it goes! Wish us luck! 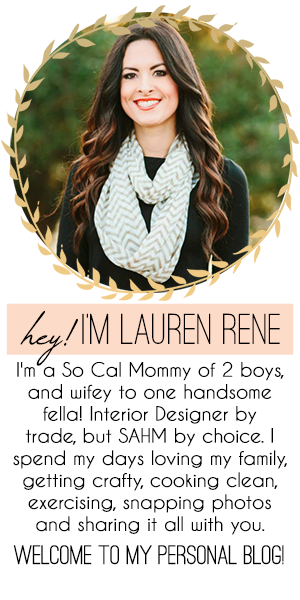 Love this, Lauren. I was using a chore app where you can add and remove stars…and that worked for a bit. But, I think with this being so visual it would really entice my children to have good behavior. Thanks for sharing! I also like how the pom poms are such a visible incentive, which I think is key at this age! Totally agree Liz! I know it’s only been 2 days, it may just be a fluke but he’s been amazingly well behaved. I think just having the chart out in our kitchen with that pom-pom jar is all the incentive he needs. I say give it a try! I definitely want to give this is a try. I looked at the rules on the other blog and some of their stuff seemed a little extreme, like not letting them say no or cry if they are not hurt.. I don’t think that sends a good message at all – you should blindly follow authority/your feelings are wrong. Anyway, I would love to see what you use for your rules! You know I printed the rules, but we haven’t looked at them. We have been really casual and focus mainly on keeping the “lizard” as high up on the chart as we can. The only part I took from it is when he hits “awesome” he gets a pom-pom. If he is in the green zone and up before bed he gets 5 pom-poms. He’s been so good these last few days the red zone hasn’t even come into play. The only reason for getting there would be intentionally hurting Shane. Then it will just be quiet time and taking away a pom-pom. I definitely think you should make one…it’s crazy how well it’s been working! I can’t find the rules. I can’t seem to find the blog? 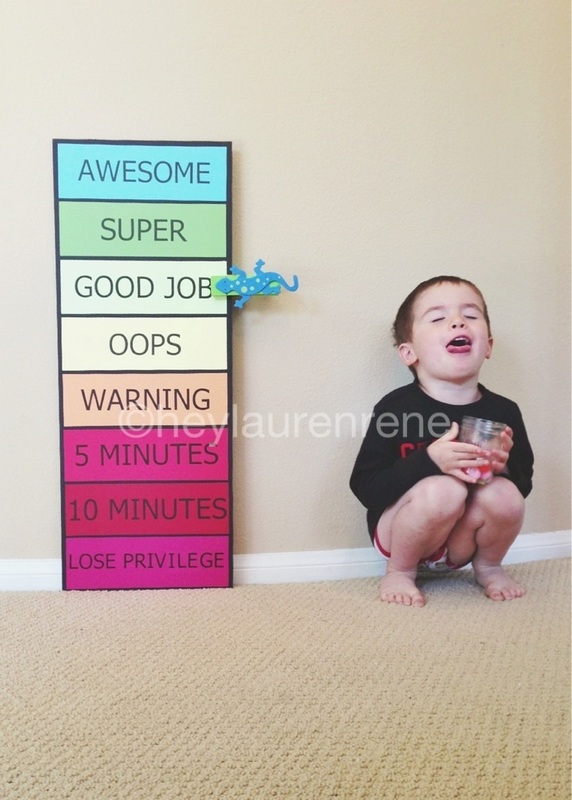 My son is 4 1/2 and we struggle with behaviors and also the want want want. We also struggle with consistancy between Jason and I. Need help. How to find the rest?? Hi Deena. In the first sentence of my post click on the word “this” it should lead you to the original blog post with the rules. We don’t really follow them strictly. 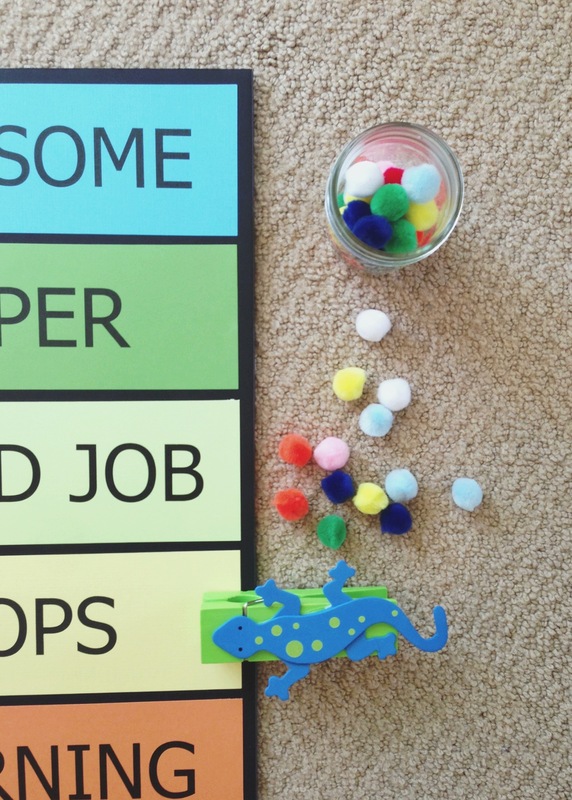 We just move the clip up and down the chart throughout the day and if he ends at “awesome” at the end of the day he puts 3 pom poms in a jar. If at any point during the day he ends up below “warning” we take 1 pom pom out of the jar. Honestly since starting the chart we rarely have to implement it, he works real hard to keep himself in the awesome zone. I hope it helps you out! I’m planning on doing this soon for my 2.5 year old. Your’s looks insanely perfect! Perfectly straight lines etc. Did you make it the same way as the blog you linked, just on a different material? It’s a great chart I definitely recommend doing it. I used colored card stock and mounted it onto black foam core board. I think it is stiffer material than the original post used. As for straight lines I have a paper cutter at home so I can thank that for the evenness haha.